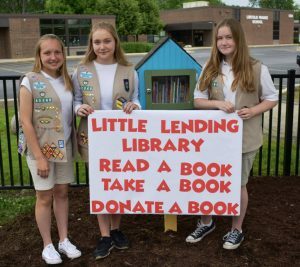 HE Parks would like to commend Girl Scout Cadette Troop #40348 from Service Unit 406 for building and placing “little lending libraries” in its Sycamore Park. A little lending library works this way: Take a book, read a book, donate a book. Children and families can take a book, read it in the park or take it home, return it for another book and hopefully donate a book that they don’t read anymore. The girls created this project to earn their Girl Scout Silver Award, which is the highest award a Cadette can earn. They wanted to complete a project benefiting children in their communities focusing on reducing the time kids spend playing video games or on their phones and encouraging them to get outdoors and read a book. The girls had to learn to use woodworking tools, earning them a woodworking badge, which contributed to the Silver Award. They found the idea on Pinterest, researched potential locations, then reached out to Schaumburg and Hoffman Estates Park Districts to see if their idea was feasible. They approximated the cost of materials, purchased materials, built and painted the libraries. To fill the libraries with books they hosted a book drive at school, purchased books from the Schaumburg Library used book sale and received some donated books. The libraries are located at Sycamore Park by Lincoln Prairie School in Hoffman Estates and on the walking path to Bison Bluff playground at the Spring Valley Nature Center in Schaumburg. For more information about the Hoffman Estates Park District visit heparks.org, and for more information about the Schaumburg Park District visit parkfun.org.